This house is part of 8 houses known as Keller Row. 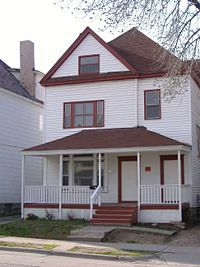 In 1889 Annice E. Keller had the eight homes, now known as Keller row, built on the East 6th street side of their property. The reason why is unknown, but speculating that it was an investment might not be that far off as there was a housing boom of large middle class homes being built in the area. Another possibility is that she built the eight houses for her eight children. The architect chosen to design the homes was Edwin S. Radcliffe who is listed as having his office at the Mannheimer Building in St. Paul. Not much is known about Radcliffe. He was the son of one of the great builders of St. Paul Abraham Radcliffe who designed a number of notable buildings still standing. This was one of Radcliffe's last commission in the city before he moved to Duluth to practice there. One of his prominent houses in Duluth is entitled the Marcus and Sarah Fay house commissioned in 1902 at 2105 East Superior Street. The builders of the row homes is listed as a E. Sephton and Company at 582 Jackson street in St. Paul. The original building permit was filed on May 31st 1889. One permit was submitted for the 8 detached dwellings at a cost of $5000.00 to build each. The memoranda on the permit reads “Commenced work on the foundations May 31st on the frames 10th June & finished all the dwellings about September 26th.” The foundations were built of Limestone blocks, earth and concrete. The rest of the dwelling is built of wood. It is also said that Annice Keller herself resided briefly at the address when it was first completed. One of John's and Annice's children, Herbert P. Keller (B. February 7th 1861) was the first mayor of St. Paul to be born in the city. He is listed as living with his brother Charles E. Keller at 771 6th street in 1910, became mayor of St. Paul from 1910 to 1914. Keller Lake and Golf course are named for him. Annice’s Obituary reads “DIED: KELLER - At the family residence, Eichenwald Street, in the 56th year of her age, Mrs. Annice E., relict of the late John M. Keller. Funeral services at the resident at 2 o'clock, Saturday, Jan. 26. (Undated) Born 11/20/1835 d. 1/23/1895 married to John on 26th of July 1857. This page was last modified on October 4, 2013, at 03:51.